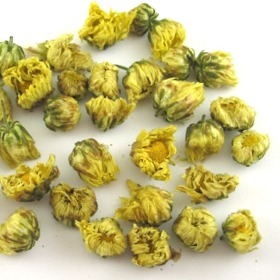 Chrysanthemum buds tea are produced entirely from young buds of chrysanthemum flowers. This thirst quenching tea is great for relaxation and releasing stress. We recommend adding either rock sugar or honey to enhance the taste of the chrysanthemum tea. Chrysanthemum buds tea is excellent in treating mild sunstroke and easing a sore throat. Since this drink is caffeine free, Golden Chrysanthemum tea would be a perfect summer time drink for kids. Rinse tea cup and teapot with hot water. Use around 4 to 5 flowers (2g/0.07 oz) for every 225 ml of water. Steep tea leaves in hot water at 90°c (194°F) to 95°c (203°F) for 2 to 4 minutes, or until the liquor turns light yellow. You may try brewing this tea with a bit of rock sugar. Serves well hot or cold. You can`t beat this herbal infusions! Hot or iced they are the best. I really like the fact that this tea is caffeine-free. Perfect for the evenings! Tiny buds of the larger flower, same great taste! I just returned from my first trip to Shanghai and was turned on to this wonderful tea. I have been searching for the high quality of the tea I had in Shanghai and finally found it with Teacuppa!! Excellent, authentic. Just right!! Thank you TeaCuppa! !